I’m about to get real nerdy right now, so if you don’t have the brain energy then go drink some iced coffee and come back later. You can put your foot in the sink, don’t worry no one is watching, Haha. Since all Muslims are obligated to be in a state of purity before prayer, we should all know about the preventive and healing wonders of wudu, so I decided to collect some information and share it with all of you. 1.Washing the Hands prevents the transmission of many contagious diseases. 2.Washing the Face recharges such organs as the intestines stomach and bladder, as well as having positive effect on the nervous and reproductive system. 3.Washing the Mouth removes food particles that could cause teeth and gum problems. 4.Washing the Nostrils removes germs trapped inside so they do not reach the respiratory system. 5.Washing the Ears decreases high blood pressure and relieved tooth and throat pain, as well as removing any extra wax that could cause ear infection and general body imbalances. 6.Repeated Washing of the Face invigorated facial akin cells and helps prevent early wrinkles. Skin cells and helps invigorate the ends of the blood vessels, as well as the nerved and glands that are near the skin surface, and there fore helps them perform their functions efficiently. 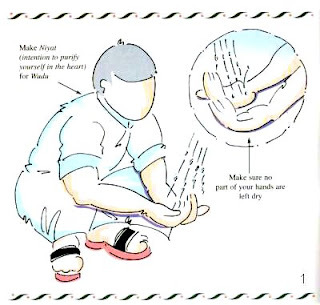 7.Washing the Feet helps prevent athlete’s foot a fungal problem of the feet. The Prophet (peace and blessings of Allah be upon him) also encouraged doing ablution before going to bed. This same ritual is also encouraged by Yoga experts who say that washing important motor and sensory organs such as the hands, arms, eyes, legs, and mouth before sleep using cool water relaxes the body preparing it for a deep sleep.